Guerilla Games and Sony have released 8 minute of Horizon Zero Dawn gameplay video while showcasing the game at 2016 E3. The video contains a raw gameplay, featuring Aloy hunting a mechanical beasts. Horizon Zero Dawn Gameplay video begins with Aloy leaving the village to investigate some rumors of a demon haunting nearby village. As she makes her way through the valley, she runs into strange machines, she dispatches these mechanical enemies quickly using her sling and bow. She also takes some components off them, which she will use for crafting. 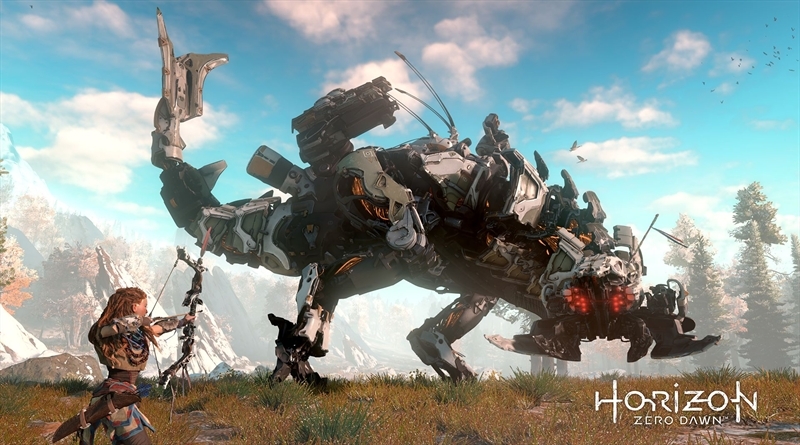 In Horizon Zero Dawn Gameplay, we also see some of her weapons and tools in action such as the rope launcher that she uses to capture and tame a mechanical beast. After that, she uses that beast as a mount. Finally, when she reaches the village, she fights the robot that keeps corrupting the other mechanical robots in the village. This encounter of Horizon Zero Dawn Gameplay video plays out like it’s a boss fight and dodging seems very crucial for your survival in the combat. She finally manages to take this robot boss down, but for this she has to exploit its weakness of fire. Which means ignoring such attributes during the combat would not be wise. Horizon Zero Dawn will be released on 28th February, 2017 next year only on the PlayStation 4. Since Horizon Zero Dawn is being developed by a studio owned by Sony, it is safe to assume that Horizon Zero Dawn will not be ported to other platforms.